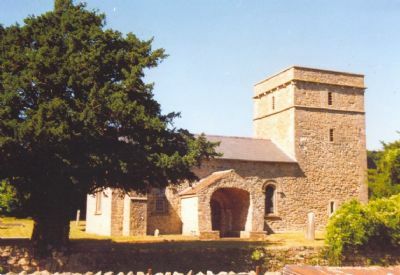 This is a small Norman Church built about AD 1170 although there is reason to believe that the eastern end containing the altar is of Anglo-Saxon origin as there is “herringbone” masonry to be seen In the outer walls. This would date from about AD 1050. 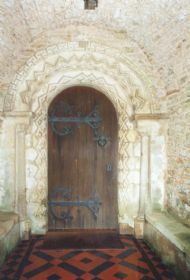 The late Norman arched door-opening is ornamented with zig-zags. The porch and its stone seats are believed to be a late medieval addition and the door and ironwork date from 1875. The nave is C15th with a Pre-Reformation (1536) wagon roof with bosses at the centre of each rib. . The font is Norman (AD1100-1135) There are Norman features of the West and East arches under the tower and above all, the plain heavy rounded groins in the vaulting which rest on strange grotesque dragon-heads. In the South wall there is a small window of medieval Somerset glass.